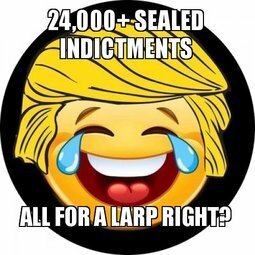 You know, with 24,000 and more (I've heard up to 30K) sealed indictments about to unseal, I would imagine that there are a LOT of people out there who are more nervous than a long tail cat in a room full of rocking chairs. So it would make sense that people would be wanting to know timetables and also signing like birds to get well needed sleep, necessarily, or even unnecessarily ie: tipping themselves off with disastrous counter measures due to paranoia and a heavy conscience. If the storm is real and is Q is real, which they are, then in the space of unknowing, a lot of bad people must be going insane maybe even including Hollywood (Kimmel?) and Washington "elites" since the law isn't the law unless it applies to everyone and not simply political opponents either but people on both sides. Not a good time to be a really bad and evil person and the higher up they are on the chain, perhaps the more nervous they should be. It's time to tip those dominoes Mr. Trump and Mr. Q. Look at Loretta Lynch trying to get ahead of things with her interview, Comey on his book tour - or is that just more rope? Again, I say that it makes the whole world a better place when the devil is scared, more open, more real, more authentic. Maybe it's the mere prospect of Justice in the air I don't know, but it's definitely palpable. When you google map the coordinates 61.049059,97.741991 it shows as Souther Russia, not China, and is a yellow shaped Square area. Duh, just saw that's been posted already. What do think, Agartha: Human trafficking and opioids is going to be the explanation for the record-breaking numbers of indictments? Early on I thought MS-13, but the maps showing where the indictments are bulked would seem to negate that to some degree. Sure would explain the E.O. on property seizure of human traffickers too. If so, could probably build two walls with that. ATS is almost becoming unusable. I'm getting messages saying we cannot copy and paste from the Q boards. It seems it does not matter if you use the "EX" code and provide a link to the board. I keep getting messages saying it's against the rules and they keep deducting points. I don't get it. We can't link to the chan boards and now I guess we can't copy & paste from the Q boards while providing the link. I think ATS needs to re-think their rules. Perhaps it's just somebody "treading on me". What do I know? Nothing I guess. CA has something like 1/4th of the US population and 1/3 of the US economy, isn't that about right? At one point in February/March, President Trump was contemplating pulling ICE and Border Patrol out of California, and letting them reap the results of their stupidity. But he realized that more American families in California would be assaulted and murdered without the Feds doing all they could. Let the leadership of California have the blood on their hands and conscience. Thanks for reminding me to go check my ATS Inbox for the first time this year. How do you know when you have messages there WhatTheory? Other forums that I belong to have some kind of an animated notification in the upper right corner of the window.